On Friday, September 15, 2017, the scheduled drone survey took place over Wasa Lake. The purpose of the survey was to collect photos and information in order to determine the extent of underwater foliage, particularly Native Milfoil. VAST Resources, who conducted the survey, will provide maps to form a base-line from which WLLID can monitor the spread and growth of Native Milfoil. A second survey will be conducted in early spring of 2018. The information gathered will help the board to make informed decisions about the next steps to be taken. ​VAST Resources technicians Claire Crowley and Ben Meunier prepare the drone for flight while trustee, Cliff Youngs and Laurie Kay observe. On Sunday afternoon, October 23rd, Improvement District trustees and community volunteers donned bright orange safety vests and walked the lake shoreline searching for garbage. Their search concentrated on BC Parks and other public access points in four locations: where Hansen Channel enters the lake, shoreline north and south of Cedar Road, the small bay just north of Ponderosa Road, and the area at the end of Elm Road. More than thirty pounds of garbage was picked up from these sites, mostly small bits of plastic and wrappers, but including golf balls, plastic toys, cigarette butts, and beverage cans. The oddest item found was an old blue plastic dingy abandoned under a bush on the edge of Cedar Road. The volunteers discovered that although much of the lakeshore is generally clean and well cared for, Cedar Road is, by comparison, a neglected orphan. The area is used as a beach and boating access point by many people, but it is not an area claimed by either government or residents as their responsibility to clean. Hence, it was the spot where the most garbage was found. Another unexpected discovery was the amount of Styrofoam bits noted along the shoreline on the south end of the lake. 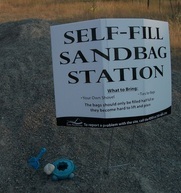 Although volunteers tried to collect as much as they could, the small particles are tough to pick out of the sand. Styrofoam is obviously breaking apart from docks and washing onto shorelines where it continues to break into smaller and smaller bits that not only litter the shore, but can kill the birds and fish that ingest it. Styrofoam is no longer recommended for new dock construction. Fortunately, although the temperature was nippy, the sky was clear and the sun was shining for the twelve member cleanup team who finished off the event with a barbeque. The sun shone again on the following Friday afternoon when two volunteers completed the job by cleaning the shoreline on the north and east side of the lake, concentrating on BC Parks areas: Main Beach, Horseshoe Beach, Skiers’ Beach and Campers’ Beach. They picked up another 9 pounds of garbage. The trustees would like to thank their families and other volunteers from the community who came out to help, and also BC Parks for funding, Skookumchuck Pulp Mill for the loan of the safety vests, and Wasa Lions for the loan of the litter pick-up sticks. We would also like to acknowledge that there are people in the community who make a habit of picking up garbage whenever they stroll the lakeshore. Thank you! This project is registered online with the Great Canadian Shoreline Cleanup, an across Canada conservation initiative of the Vancouver Aquarium and World Wildlife Fund. The event followed all their guidelines including data collection, protocol, and submission of forms. In the fall of 2014 a resident contacted the Land Improvement District to report the presence of an aquatic plant they suspected was invasive Eurasian Water Milfoil. Trustees notified the Cranbrook office of the Ministry of Environment (Forests, Lands, and Natural Resources Operations FLNRO) who identified the plant as Northern Milfoil which is a non-invasive native North American species. At a public information session coordinated by EKISC (East Kootenay Invasive Species Council) and the Land Improvement District held August 16, 2015, residents expressed concern that although the milfoil was native, it could reduce recreational opportunities on the lake and they requested that the Improvement District investigate ways that its growth could be managed. Although the milfoil in Wasa Lake is NOT Eurasian; it is Northern (native) milfoil and provides habitat for aquatic life, trustees responded to the residents’ request and agreed to address the issue. ​Over the next months, a special committee of trustees and other community volunteers gathered information about milfoil (native and non-native) and how other communities (eg Columbia-Shuswap) were dealing with it so they could make informed decisions about how to proceed. The trustees applied for partial funding and a removal permit, both of which were granted. Money was set aside for the project in the 2016 budget. Trustees concluded that machine harvesting was beyond the Improvement District’s financial capacity but hand pulling and raking were worth a try. In May and June of 2016 they attempted to hand pull from the shoreline but sank into knee-deep mud. They found that raking from a boat was effective but slow. They found the most success with a volunteer diver who hand pulled milfoil from the lake bottom and brought it up by the armload. Volunteers prepare to use a rake to comb the lake bottom to dislodge milfoil roots. People in the rowboats are gathering up any milfoil fragments so they don't escape and start new plants. 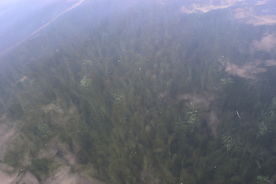 Milfoil spreads by fragmentation. ​Volunteers pull up the rake loaded with milfoil. The milfoil is deposited on the floating platform and then transported to the local refuse site. 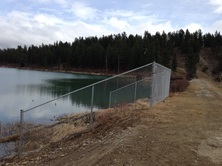 Trustees requested special permission from the Regional District of East Kootenay to dispose of the milfoil. ​Diver Tony Miguel first tried gathering the milfoil by hand and placing it in the mesh bag to bring up to the platform. Tony soon realized he could gather more milfoil faster just by bringing it up by the armload and depositing it on the platform. Diving and gathering the milfoil by hand proved to be more effective than raking. ​Experts agree that the best approach to the control of milfoil is prevention. The WLLID committee is currently working on an education program to inform residents and boaters what they can do to avoid spreading milfoil. The committee will continue to meet to determine the next actions. ​We are grateful to the Columbia Basin Trust and East Kootenay Regional District for their support. The Columbia Basin Trust provided a grant of $847.17 to help pay for the project. Thank you! Woody debris and excessive vegetative growth in the Hanson Channel, a man-made channel connecting the Kootenay River with Wasa Lake, has obstructed flood mitigation and mosquito control for a number of years. In the spring of 2014, WLLID trustees collaborated with government agencies and a local contractor to address the problem. Retired BC Fire Commissioner and Trustee, Bill Walkley, worked with Wildfire Management to deploy a crew of five to nine people to cut and slash small brush from the clogged channel. This initial work was at no cost to WLLID taxpayers. Invitations to tender were then offered to five local equipment contractors to complete the removal of larger debris and to dig a trench down the centre, sloping from the rail bed to the river. Catamount Contracting was the lowest and successful bidder and the job was completed within a few days, just before the spring freshet began to flow in from the Kootenay River. Wildfire Management has offered to burn the resulting three slash piles in the coming winter. Trustees anticipate that high water will return to the river faster than in the past, and that at least one well-known mosquito breeding ground has been eliminated by this work. We are very pleased with the project outcome and wish to congratulate both Wildfire Management and Catamount Contracting for a “job well done!” We also thank the Regional District of East Kootenay for a $1500 grant to help pay for the project. 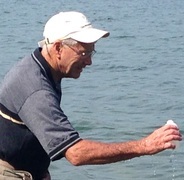 Trustee Laurie Kay takes a water sample from Wasa Lake on July 15, 2014. Recent testing indicates that temperature, clarity, and oxygen (signs of a healthy lake) are all at acceptable levels. Following procedures set out by Interior Health and the BC Centre for Disease Control, trustees have been monitoring the quality of water in Wasa Lake over the summer. Six sites were selected for testing: Main and Campers’ Beaches, and four lake access points close to where septic fields and a well head were under flood water in 2012 and 2013. A total of 8 samples will be taken at 2 week intervals over the summer. So far, all results (tested for E-coli) have indicated there are “no water quality issues.” Further details can be found at www.interiorhealth.ca under “Recreational Beach Water Quality". An unusually high snow pack this winter and delayed spring freshet suggest the possibility of high water at Wasa Lake again this year. However, trustees have been monitoring the level of water in Kootenay River and report that it has actually declined dramatically in the past week. 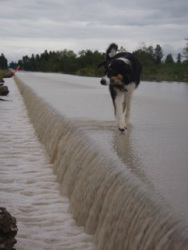 On May 24, the water level was 769.85 metres, but declined to 769.1 by May 29. The 14-day weather trend at www.weathernetwork.com indicates a mix of sun and cloud and moderate temperatures which will continue to slow down the melt. Although we cannot dismiss the possibility of high water, so far things are looking good. 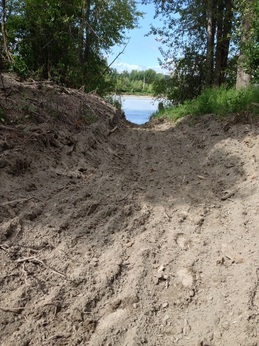 High water in June of 2013 flooded the dike between Cameron Pond and the Wasa Wildlife Sanctuary. This structure, combined with a culvert and flap gate, helps prevent high water on the river side from flowing into Cameron Pond and Wasa Lake, thus mitigating the effects of flooding. Receding water revealed that the dike was badly eroded on the north bank for approximately 100 metres. The Deputy Inspector of Dikes judged that it should be restored or it would likely fail in a future flooding event. The Improvement District applied for help from the Disaster Funding Assistance program of the provincial government. The application was accepted and a contractor was hired to complete the repair in April of 2014. The dike is now fully restored and, for the sake of public safety, a new wire fence protects the north side.